ASSETS client and participant in the 2015 Great Social Enterprise Pitch, NuLife, is making news! A couple of months ago, Schirlyn Kamara stopped by the Nimble Thimble sewing shop in downtown Lancaster. She runs NuLife, a social enterprise that teaches at-risk women to sew. They make items from recycled fabric — clothing, accessories and household goods — to sell online. Kamara thought Nimble Thimble might have some leftover fabric or other supplies to donate. While there, she got to talking with Mort Nierenberg, who runs the shop at Central Market Mall with his wife, Ruth. The couple are in their late 80s. “He jangled his keys at me … and said, ‘I think I’ve been waiting for you,’ ” Kamara recalled. Sometime this spring, Kamara plans to move NuLife into Nimble Thimble’s location on the lower level of the mall at 45 N. Queen St. The details are still being worked out, but NuLife is planning to have classroom and retail space there. Nierenberg, an expert sewing machine repairman, plans to continue doing repair work there while passing on his skills to a new generation. The Nierenbergs have owned and operated Nimble Thimble for about a half-century. They moved it into the mall when they bought the building in 1978, according to newspaper records. They subsequently sold the property, but remained as tenants. “It’s a huge project,” said Howard Jones, a board member of Handz on Hope, the nonprofit organized by Kamara that is NuLife’s parent organization. 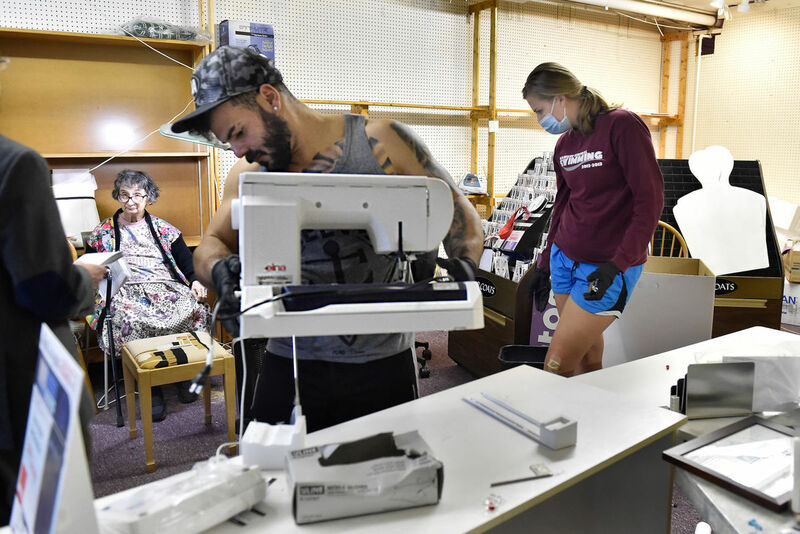 Ruth Nierenberg, seated, who owned Nimble Thimble for over forty years, watches as Millersville University students Juan Martinez and Courtney Lynn help to remodel/repurpose the store for a service learning class. Kamara has plenty of help, thanks to two Millersville University professors and their students. 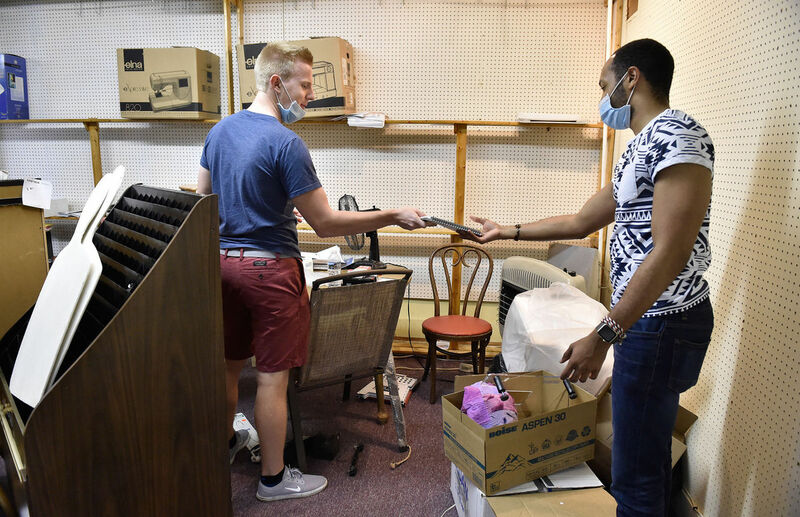 About 25 undergraduates in professor Minoo Ghoreishi’s service learning seminar have been visiting Nimble Thimble weekly this semester to take inventory and clean out decades of clutter. Later on, the students will design and set up displays, create signage and complete other tasks. Last semester, they taught basic business classes to NuLife clients, and that will continue, Ghoreishi said. Meanwhile, more than 65 students in classes taught by professor Lexi Hutto have been creating brochures, videos and a social media campaign for NuLife. Future projects include a marketing plan, merchandising and fundraising. Hutto said she is seeking donations of displays and other supplies. The two professors’ classes are independent of each other, though some students have been in both, including senior Juan Martinez. The seminar, he said, “teaches us to teach other people,” as well as to identify community needs and take action. “A lot of people who go to Millersville (University) plan on owning their own business,” senior Courtney Lynn said. The seminar gives students a realistic feel for what’s involved, she said, likening it to an apprenticeship. Senior seminars are required in a number of MU majors; service learning is one of the options for business majors. Adam Good hands off a sewing book to Jordan Johnson, both Millersville University students who are helping to remodel/repurpose the Nimble Thimble for a service learning class. Each year, participants enter a national competition sponsored by Enactus, a nonprofit devoted to using entrepreneurship to promote social welfare. MU has won the regional championship five times since 1998, Ghoreishi said. Hutto and Ghoreishi have worked with other nonprofits. Students get hands-on experience, and cash-strapped organizations get assistance they could not otherwise obtain. Kamara said it’s been her dream to have a shop to sell NuLife goods. Besides a retail area in the front room, there’s a workshop, a storage room, a back room where the classroom will be, and even a small kitchen: about 4,000 square feet in all. 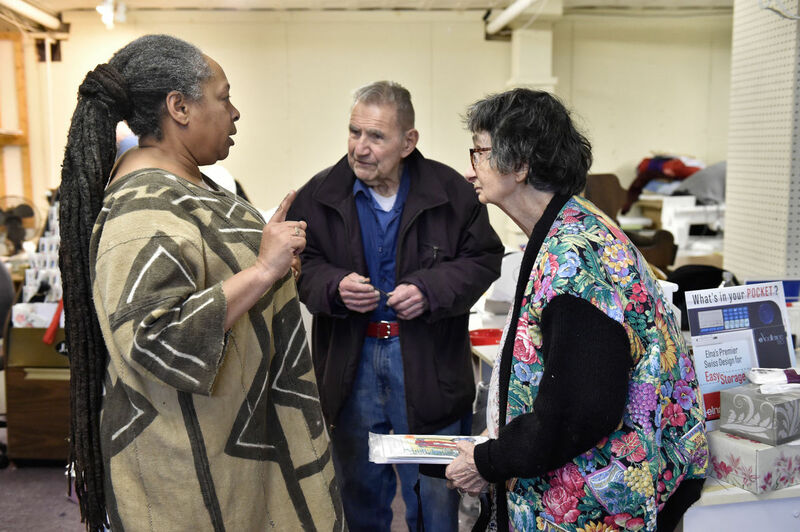 A 2015 participant in the Great Social Enterprise Pitch, a project of ASSETS and the Lancaster County Community Foundation, Kamara has received donations through crowdfunding and from the foundation, and is seeking additional support. “We’ve got a lot to do,” she said.